Desert Cloud [Transformer 3] is a public art presentation by Bernhard Sommer. 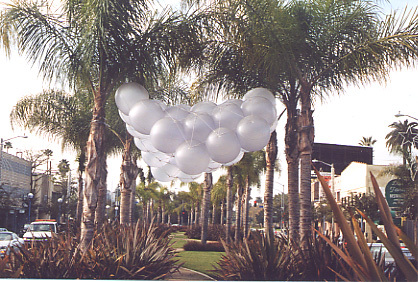 It is located on Santa Monica Boulevard and Almont, West Hollywood, October 2002-January 2003. This temporary installation was made possible through a collaboration between The City of West Hollywood's Art on the Outside program with the MAK Center for Art and Architecture and the Schindler House. "Architect Bernhard Sommer has been working since 1999 on his "Transformer" series, an attempt to make real the promise of a "fluid" architecture....With Desert Cloud he presents a model for an architecture "light and changeable as clouds." 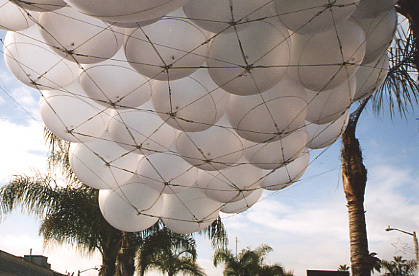 Inspired by southern California topography, the work tethers together several balloon-like units with ropes that may be adjusted to create innumerable forms, according to the desires of the users." Information about the work was gleaned from the Art on the Outside press release. Photographs by Ruth Wallach, taken on December 21, 2002.